Instead of keeping the entire dataset in RAM, RoF only keeps the keys and the Redis dictionary (the data structure behind the keys) in RAM, along with the “hot values” of the dataset (the working set). The “warm values” , the lesser used portion of the dataset, are kept on the local Flash storage. To avoid head-of-the line blocking scenarios resulting from the single-threaded nature of Redis, RoF is based on a multi-threaded asynchronous architecture that guarantees no blocking between a heavy request made to Flash and a light request made to RAM. Note 1: RAM-to-Flash is automatically adjusted for you when using Redis Enterprise as a fully managed service in a VPC. For on-prem/self-managed deployment, adjusting your RAM:Flash ratio is as easy as moving a slider. Note 2: A scale-out process may be triggered when adding more RAM to your memory quota, and a scale-in process may be triggered when adding more Flash to your memory quota. These processes will be completely automated when using Redis Enterprise as a fully managed service on your VPC, but require manual intervention when Redis Enterprise software is self-deployed. Redis Labs engineers have provided a few important fixes to these engines in order to make them compatible with Redis. More info about this benchmark can be found here. RoF is designed from the ground up to achieve the optimal performance over the new persistent memory technologies like Intel 3DXPoint. Persistent memory is designed with DRAM and NAND (Flash) integrated in the same chipset, and the software that uses the chipset can control which part of the data should reside on the RAM side of the chipset and which part should reside on Flash—exactly the way RoF works! 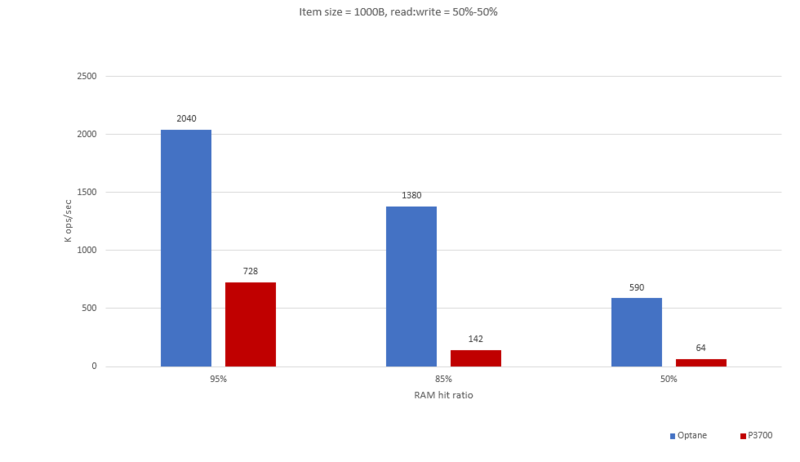 Note – RoF benchmark on Intel Apache Pass will soon be published.